AUTOGRAPHED DALE EARNHARDT JR 2017 AXALTA 1/24 ACTION. Limited edition of 288 made. Personally autographed on the windshield by Dale Jr.
Comes with a certificate of authenticity from JR Motorsports and features a JR Motorsports hologram on the windshield. One of Dale Earnhardt Jr.
S most colorful paint schemes from last season is getting a makeover and it looks better than ever. Made five starts in NASCAR®s Premier Series behind the steering wheel of the red, orange and yellow No. 88 Axalta Chevrolet SS before sitting out the second half of the season with concussion like symptoms. He will start 13 races in the No. 88 Axalta Chevrolet SS, which has a fresh, new look that incorporates the same colors from last years design. Axalta manufactures, markets and distributes paint for commercial vehicles, refinish aftermarkets and industrial coating systems. Every NASCAR® fan will want to upgrade their die-cast collection with Lionel Racings hottest, new Action Racing Collectables die-cast Earnhardt Jr. This is an Action Performance Platinum Series collectible, the #1 name in NASCAR diecast collectible cars. We have been serving thousands of NASCAR fans online since 1999. We also operate a full-fledged walk-in store located in Gainesville, GA. We take collecting diecast seriously. The cars we send are mint, unless specifically stated otherwise. Your item is brand new. No smoke , no pets, Brand new out of a new case.. 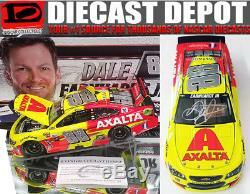 The item "AUTOGRAPHED DALE EARNHARDT JR 2017 AXALTA 1/24 SCALE ACTION NASCAR DIECAST" is in sale since Saturday, August 18, 2018.